Today I bring you a hit from my youth. 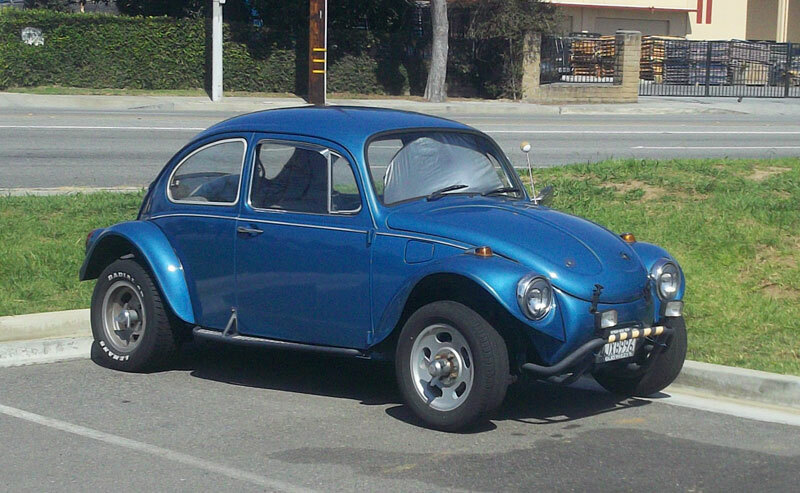 Of course, the VW Beetle is a well known hit, but for me the Baja Bug represents a second hit. As I recall, there were four or five of these parked at my High School, with varying levels of build quality and final finishes. The car met the needs of a teenage driver, included some very clever engineering, and allowed greatly increased off-road capability with a minimum financial outlay. 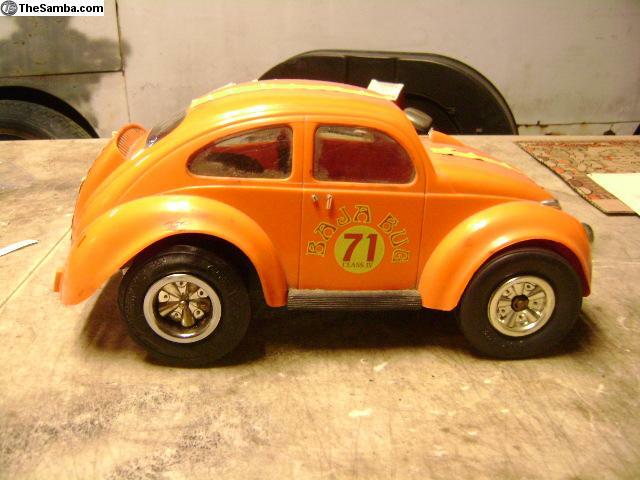 This low budget approach also meant that none of the cars I remember looked this good, but unpainted fenders and steel VW wheels defined the essence of the Baja Bug experience. It played well in California, Colorado, and the Midwest, where open country beckoned to the young and adventurous. 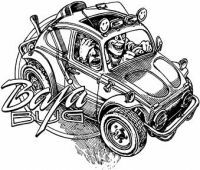 VW Beetles were a dime a dozen, and turning them into a Baja Bug allowed the owners to venture off road without tearing off the fenders. This head on shot shows the genius of the Baja kit. By shortening the trunk lid and raising the front fender edges, approach angles improved significantly. This exposed the front tires so they could attack obstacles, saving the body panels. 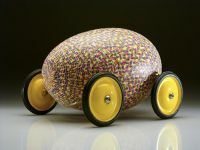 The light nature of the car, combined with rear engine weight transfer and power meant that the tubular bumper could also act as a skid plate, and ride up over obstacles with minimum fuss. At the rear, the same thinking applied. 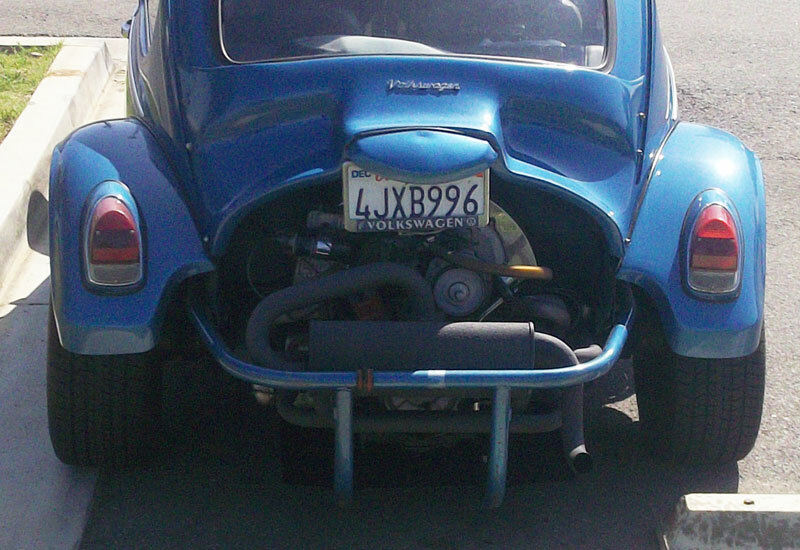 Chopping the body clear of the engine helped engine cooling, and allowed the bug owner to toss out the engine cover. An engine that extended past the rear wheels decreased the departure angle, but a flat skid plate and tubular bumper provided simple (and cheap) protection. 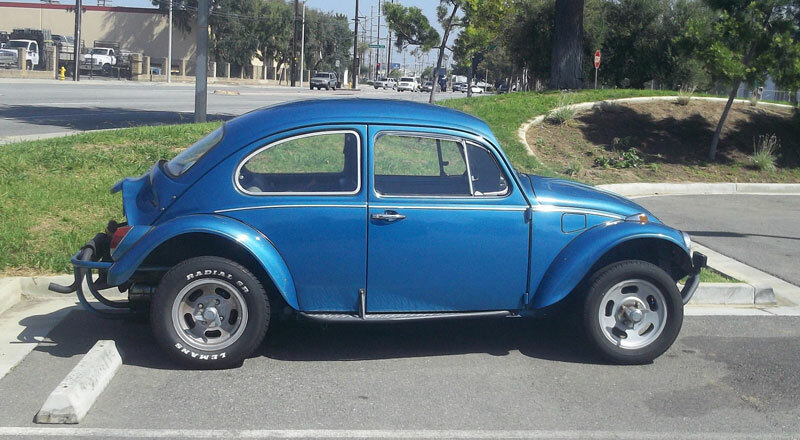 Being a car fan of a certain age, I needed to nail down the model year of this Bug. This tail light assembly came out in 1968, and gained a flat red reflector on the side of the metal tail light housing in 1970. The fuel door and bright trim also fit a ’68 to ’70 timeline, so if this Bug has the original tail lights (always a big if), we’re looking at a ‘68 or ’69. 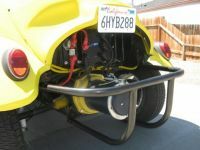 The Baja Bug body components were both simple and easy to install. Once an owner had removed the fenders and cut off the front of the body, a fiberglass cap filled the gap and covered the rough sawn edge. 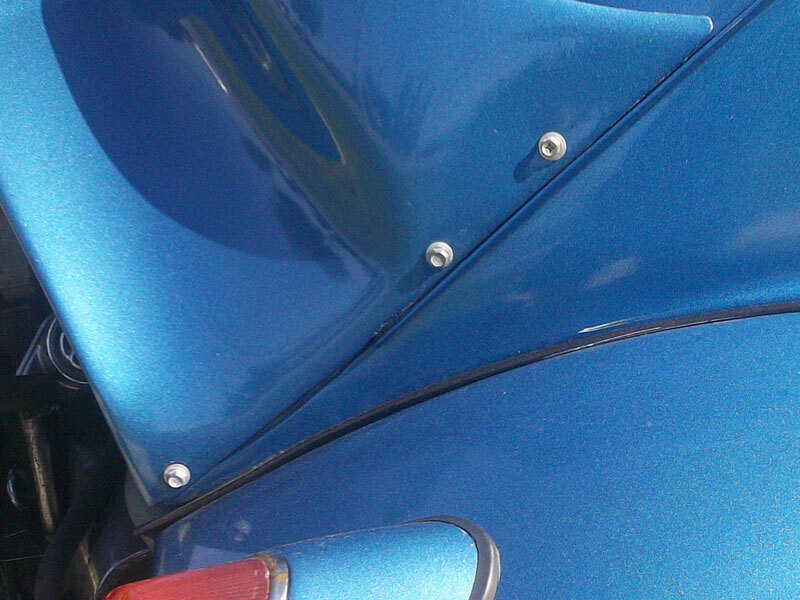 A new hood matched up to the back edge of the cap, and to protect the new body components, the tubular bumper bolted solidly to the VW frame. 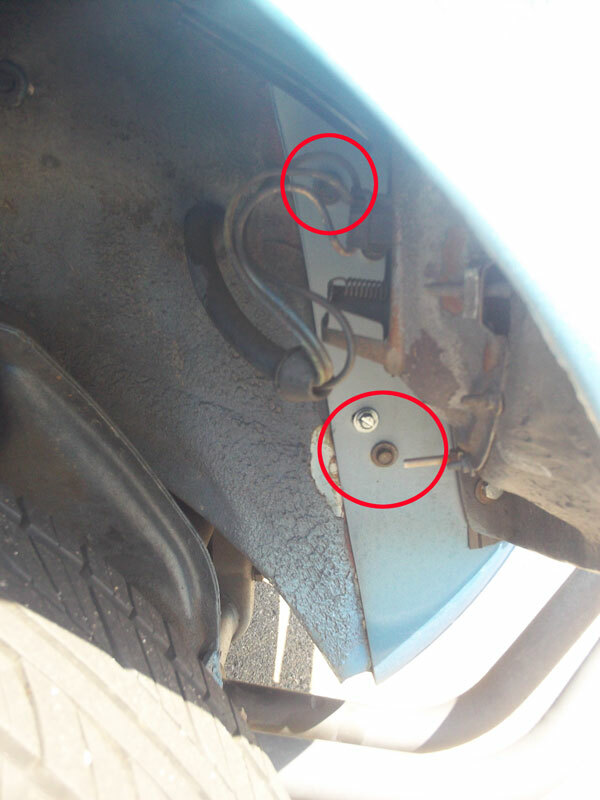 Under the front fenders, simple sheet metal screws held the cap on. This design allowed the most thumb fingered craftsman to mount the body parts easily with common tools. With the new shorty fenders mounted, these screws were also out of sight and out of mind. At the rear, a fiberglass cowl covers up the saw lines, and masks the raw edge where the hood used to meet the body. During installation, the factory drip rail helps position the cowl, and a the scoop eliminates any ragged fit issues between the cowl and the body. Once again, sheet metal screws hold the body panel on, but rather than try to hide them, the designers (perhaps inspired by the basic nature of the design) simply left the screws in plain sight. 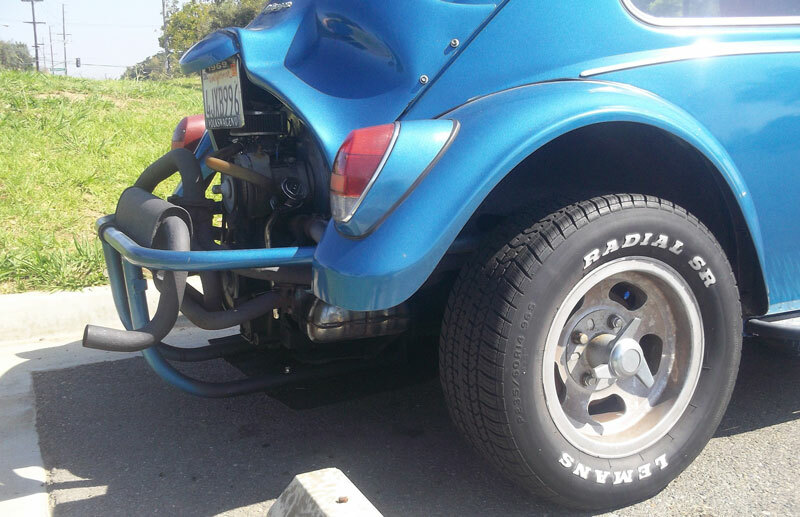 This side shot reminds me of the final element of Baja Bug design- Running board removal. This step accomplishes several things. First, it prevents rocks from bending the running boards up and jamming the doors shut. Second, since the shortened fenders expose the ends of the running boards, removing them keeps the boards clear of trail obstructions. Finally, the running boards also lose quite a bit of rigidity without the fender edges tying things together, a problem solved by removal. It looks to me as if the front tag says 1969, so you’re obviously right with it being either a ’68 or a ’69. 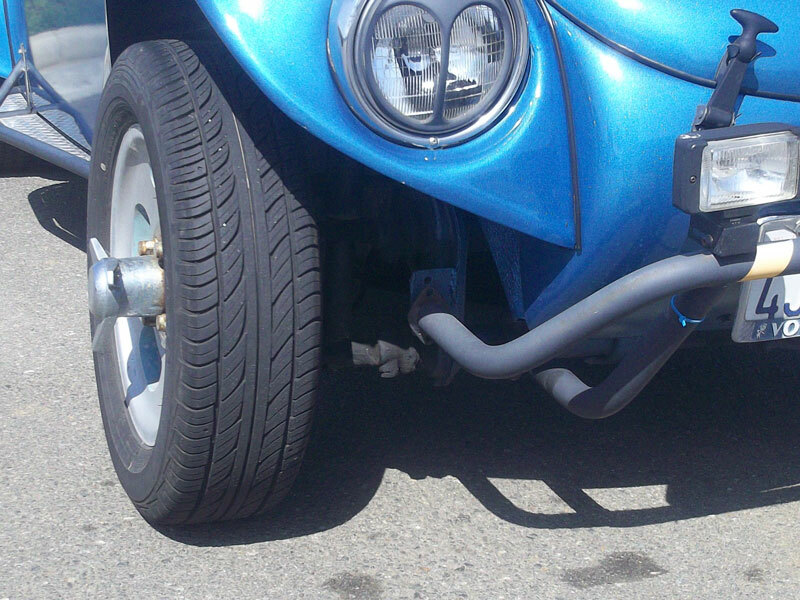 The lack of significant rear wheel camber also nails it as ’69 or later with IRS instead of swing axles. A close look at the rear view photo also shows the IRS setup. The lack of a finger indention for the gas flap puts it at 1969-1972, with the plate frame being 1969 that’s what I’d say it is. I actually own a Baja Bug. It has been stored indoors since the early 70s, and has not been started since maybe 1975. A genuine one-owner car. OK, not a real one, but the Cox gas powered version with the little cable recoil starter that would blister your gas-covered fingers. This picture is not mine, but similar. I should probably mark it down as one more hobby that I will never get back into and find a nice home for it. Tek screws holding the engine cover are post classic but a great car. First rule of building a baha bug the older the better preferably an oval rear window model for body strength do not use one of the late ones if you plan to off road it VW progressively thinned the metal, 67 they did it again advances in metallurgy gave more strength with less material clever bastards except they didnt expect people to be rolling them upside down on beaches years after they should have been scrapped or using them for deer hunting and such, VW were repurposed here as Terras given a crude body of a ute and sold to farmers you could have Volkswagen or ford transit 1700 V4 engines which people replaced with anything else at the first opportunity, rubbish in a big van like a transit the Shaky V4 works fine in a Volkswagen van and it and its V6 essex cuzzy will bolt neatly onto the Volkswagen transmission of a bug or derivative of one, we could get a front panel that mounted the headlights, that and an engine cover or belt shield were all you needed to buy and just chop the unneccessary pieces off. Bash plates are all thats needed and stand the exhaust up out of harms way. The one pictured is fine for a parking lot but its never been off road in its life its a pretty bug, a girls bug(sorry Gem) the front bar is attached to the axle or its mounts I’m not sure I like that, I do like the alloy checkerplate side bars they’d keep trees off the doors, but sticking the exhaust out as first item of defence at the back is really stupid. Even on a beach I’d want a rollbar in a VW especially this one its too ‘new’. 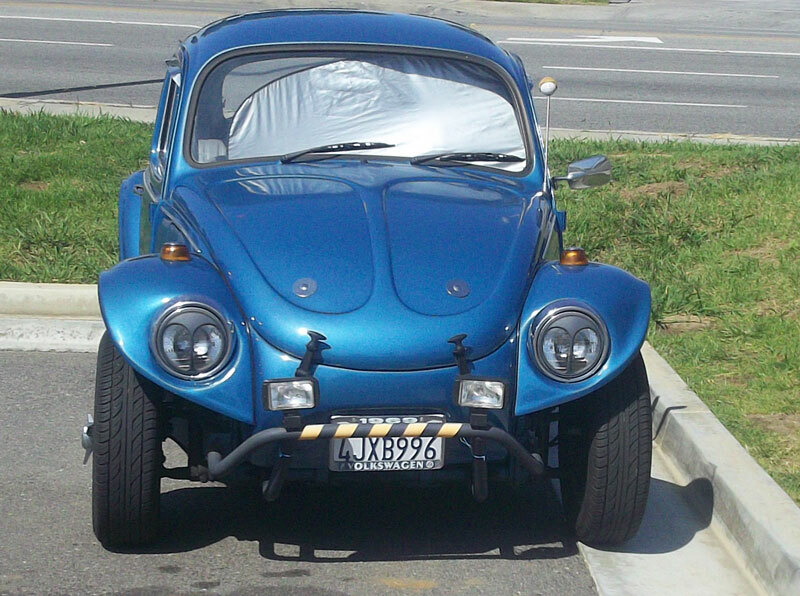 Always liked them…but my Beetle was a Super, entirely different front end. No Baja kits for it; and no use – the MacPherson strut front end wouldn’t have fared well off-road. 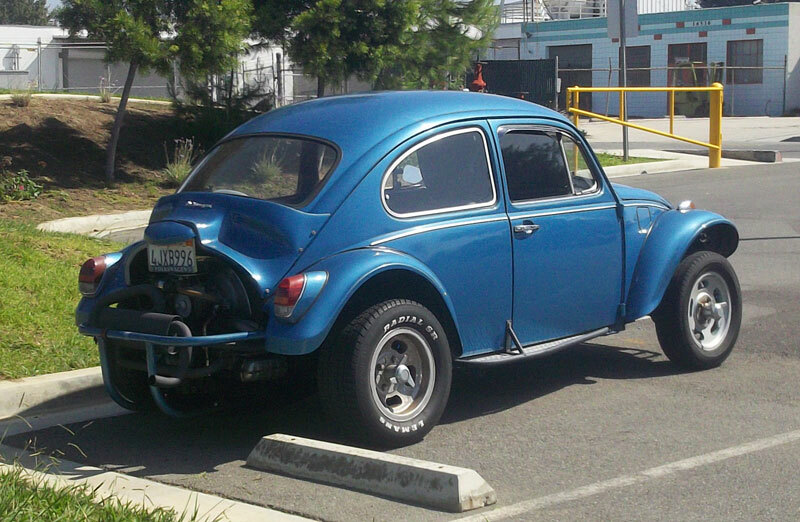 I had considered getting a regular Beetle for just his conversion…but economic realities precluded. “Narrow eye” is what many called the ones with the head lights in the front cap while today’s featured vehicle is the “wide eye” version. I’ve always been crazy about the way Baja Bugs look. The VW is simply an egg on wheels, a shape that just feels so right. Stripping it down makes it the pure VW form. I also love the exposed engine, especially when it’s running. The works are in plain sight, like a motorcycle or even a steam locomotive. 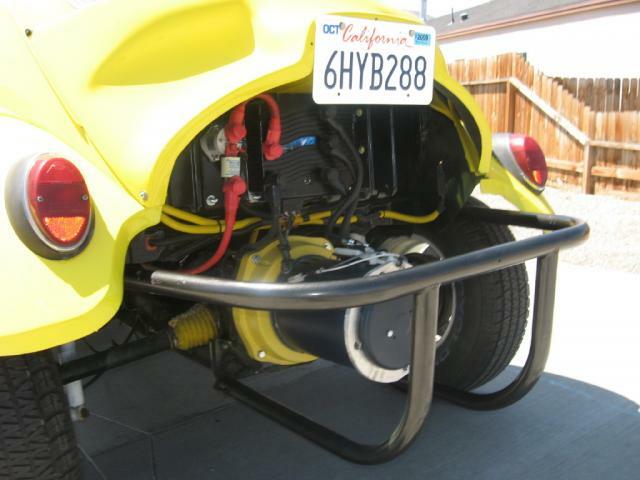 The Baja Bug is a very popular EV conversion, since it’s cheap, plentiful, light weight, everything’s easy to get to, and it shows off its electric powerplant for all to see. Here’s one of many from the EV Album (link). This one is state-of-the-art, with an HPEVS AC-30 induction motor and lithium-polymer batteries. Sure looks like the kit available from wilderness EV. Had a bug that I was going to Baja but went trike instead. If that wasn’t dumb enough, I went electric. Had it running when someone got to it and gave me about six months of a depressed state. Like Bryce, I think this might be a street driven one only. The tires do not look large enough or knobby enough for off road. There are transaxles with a lower geared first just so they can keep up with the oversized tires. You would never get me to bet on the year of a baja. They are sort of like an omelette. Lots of broken eggs go into them. I meant to say before, thanks for the most detailed writeup on the Baja kit I’ve ever seen. All that packaging is done so well I never knew how clever it is. Engineering worthy of the car it’s done to. I sold my rusty ’68 to a co-worker for $300 so he could have a cheap project car for his son. The kid was 15 at the time. It ended up a Baja and he is still driving it daily at age 22. Since dad is a structural engineer, a properly designed and fabricated roll cage is in there. Rust and body damage both offer good justifications for a Baja Kit. Cut off the cancer or mangled structure, and cover up the evidence with kit parts. Back in my youth, a buddy of mine passed his (normal) Bug on to his sister. One fender bender later, and the sister’s boyfriend went the Baja Bug route to “restore” the car. The CC effect is alive and well. Coming home this afternoon I looked in my rear view mirror and what did I spy? A narrow eye Baja Bug. It was painted up pretty nicely in a blue-grey color. Remember John Muir’s epic “How to Keep Your Volkswagen Alive”? Its classic pen and ink illustrations were done by (the late) Peter Aschwanden. His website has a few other graphics, including this Baja Bug. You can buy posters of his greatest works at the site (link here). Its a 1968 ya goobers! That used to be my car.